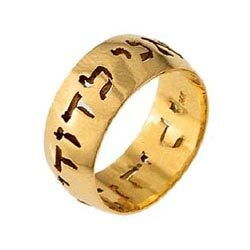 Beautiful hand crafted 14K Gold ring. The ring is Beveled and heavy weight. The letters are cut out from the ring and the words are formed as "windows" in the ring. i.e. the letters are cut all the way through.